There has been a big issue and debate in the TV channels in the recent days over the educational qualification politicians. This debate has been there since a long time and everyone has his own valid reason as to why this is important and not important. There is definitely a point when someone says that the minister holding a post should have in depth knowledge or at least minimum required knowledge to discharge their responsibilities in a righteous manner and to be able to take right decision for the welfare of the people who have given them that responsibility. Otherwise all the time they will be seeing things and hearing things from others point of view, and if the person advising them is not rightly equipped, then the people and the economy of the nation is what is going to reap the consequences. A minister for railways may not necessarily be a driver, or a minister for aviation may not necessarily be a pilot. But they should have the overall knowledge of the working of the ministry at each level and what is its role in the development of the people and the nation. On the other hand there may be people who are not professionally qualified for the post or may not have the necessary educational qualification to run the post they are given. But if that person is of good character and has intentions only to do good to the people and the nation he may take help of people who have the required qualification and are truthful and do good to the people. A qualified and educated person may be corrupt and may not be interested in the development of the nation and the people and may use the knowledge only to fill his pockets, don’t we see such people? On the other hand an illiterate or for that matter not so highly educated person, with character and principles may discharge his duties towards the public in a righteous and beneficial way. 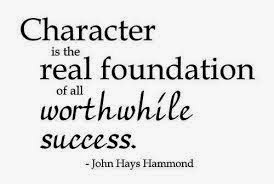 So, character is more important than qualification in politics. But if people are lucky enough o get a leader who is of good character and at the same time educated and competent, there is no bigger boon than this to any nation.